You might have seen a peek of these on my Snapchat on Friday so here's the detail! 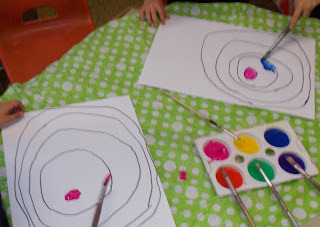 I love to challenge the little ones as much as possible in art. Yes, templates can't be avoided sometimes but isn't it lovely when you just put them in control of their creations? To the controlling eyes, these mightn't be your cup of tea, but I was thrilled with how they turned out! 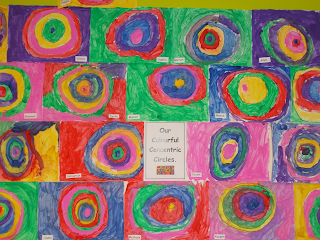 So obviously we've been doing a lot of work on shapes since September and concentric circle art fell nicely into place. To start, at one of our stations for Aistear, the children drew the circles all by themselves with pencils. Starting from the inside out, using up as much of their page as possible. They're not perfect circles, but what odds? The next step was to trace over the pencils with sharpies. This just made it easier for them to follow the lines when painting. Apart from keeping an eye on paint running low, there was very little guidance needed after that and I was thrilled with their finished pieces! Follow my Instagram page to find my Word of the Day updates. You'll find all the previous posts for Word of the Day saved in my IG highlights! Littlewoods Ireland Blog Awards 2016 - FINALIST! Little Miss Teacher was a finalist in the 2016 Littlewoods Ireland Blog Awards. Thank you to all for nominating and voting! The countdown to Easter is on!! Rhymes, chants and finger-plays for Spring!